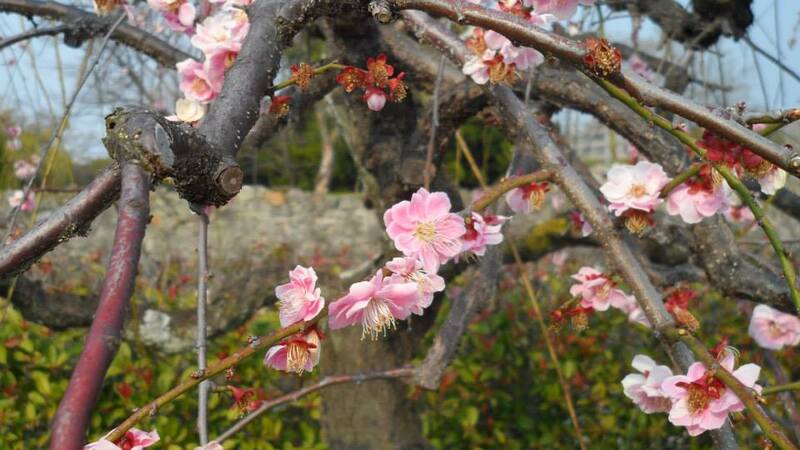 Though this is out of order for my spring break series, I wanted to make my post about my trip to Hiroshima today! A few days after I came back from America, my friend Meghan and I made a 4 day trip to Hiroshima! We had been planning on going on this trip since about January because plans fell through for us to go on a different trip together during my spring break. So instead of that trip, we decided to go somewhere in Japan! We decided on Hiroshima because it had been a while since both of us had been there and Meghan loves the city. So, the jet lagged me work up really early on March 16th and I met Meghan at Shin-Osaka station and together we headed on the Shinkansen to Hiroshima! From Shin-Osaka, it takes just over an hour and a half to get to Hiroshima and costs about 20,000 yen, or $200 USD to get there. We didn’t buy bentos before getting on the train because the nice couple that owns a sushi restaurant in the shopping street that Meghan lives by in Osaka gave her some fake-crab rolls for us to eat on the Shinkansen! Once we arrived in Hiroshima, we took the street-car tram to our Hotel. Hiroshima, even from the past, has had a tram system instead of a regular subway or train system. The best way to get around the city is to use this street car system! They even have a 1 day pass that you can purchase for about 600 yen. You can also use your IC card (such as Suicia and ICOCA ) on the trams as well, and it will even track that you have changed trams, if you have to change trams to get to a part of the city, and only charge you 1 price for the tram! We stayed at the Hotel Sunroute Hiroshima, which was conveniently located just a 10 minute walk to the Atomic Bomb Dome and about a 5 minute walk to the Peace Park and Peace Museum. It was a very nice hotel! We used booking.com and we were able to get 3 nights for 17,000 yen total, or about $170 USD. Split between the 2 of us, it was only 8,500 yen ($85USD) for 3 nights, making that about 2,800 yen ($28 USD) each night for 1 person. It was rated a 4 star hotel, so we got an amazing deal! I highly recommend using booking.com for great deals on hotels! While we were checking into the hotel, I spotted a sign that had a 1 day pass on the tram + ferry pass for the ferry to Miyajima Island, which is where we were going the next day. It was only 850 yen, and the ferry itself is normally 600 yen roundtrip, so we decided to grab those the next morning before leaving. After we checked into the Hotel, we had no plans for the rest of the day, so we set our stuff down in our room and decided to just wander around and see where we would end up. We went to the River and walked down to the A-Bomb dome. 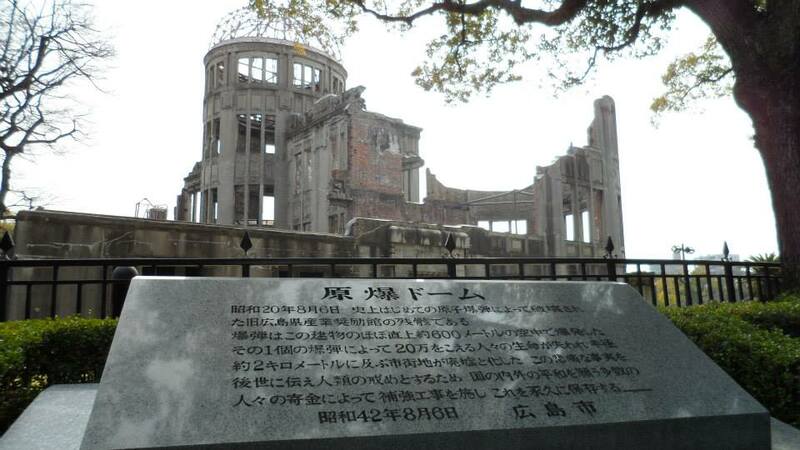 Hiroshima Peace Memorial, “Atomic Bomb Dome” 原爆ドーム Hiroshima, Japan. This was the only building left standing close to the hypocenter after the United States dropped the Atomic Bomb on Hiroshima towards the end of World World II on August 6, 1945. It used to be the Hiroshima Prefectural Industrial Promotion Hall, used mainly for educational and art exhibitions and was open to the public. It was know for its green dome at the top of the building, which you can still see remnants of in the picture above. This wasn’t my first time to Hiroshima and wasn’t my first time seeing the A-Bomb dome, but somehow it was a better experience for me this time than last time. I was able to admire it and understand the meaning behind the Peace Memorial more than I did when I was in my 2nd year of university over 4 years ago. As Meghan and I had both been to Hiroshima before and had both seen all the Atomic bomb memorial sights in the past, we agreed that we didn’t want to go to the peace park and the peace Museum again because it was a bit too heavy for us to look at again, and we wanted to make this a light trip. So, the only part that we went to see was the Atomic Bomb Dome. We both agreed that seeing the dome in the state was quite eerie, because they preserved the dome in almost the exact condition of how it was after the bomb was dropped. While we were taking picture and looking at the Dome, we also talked about similar heavy sights to see elsewhere in the world and Auschwitz came in the conversation. I want to go to Poland and see it someday. My parents have both been there and I think it is something that ,if possible, that people should go see to prevent something like Genocide from ever happening again. This Peace Museum and Peace Memorial in Hiroshima had the same meaning, to prevent another atomic bomb from being dropped anywhere in the world again. 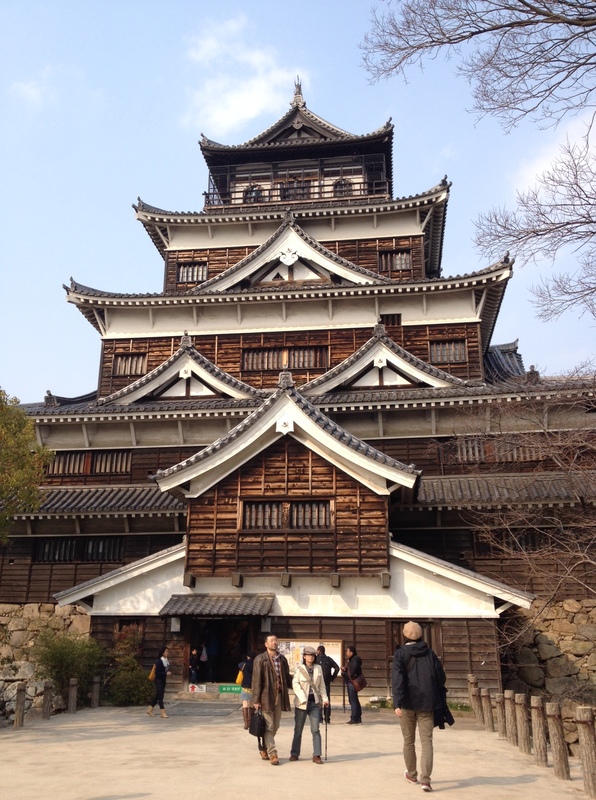 After finishing up at the Atomic Bomb dome, we decided to head to Hiroshima Castle. 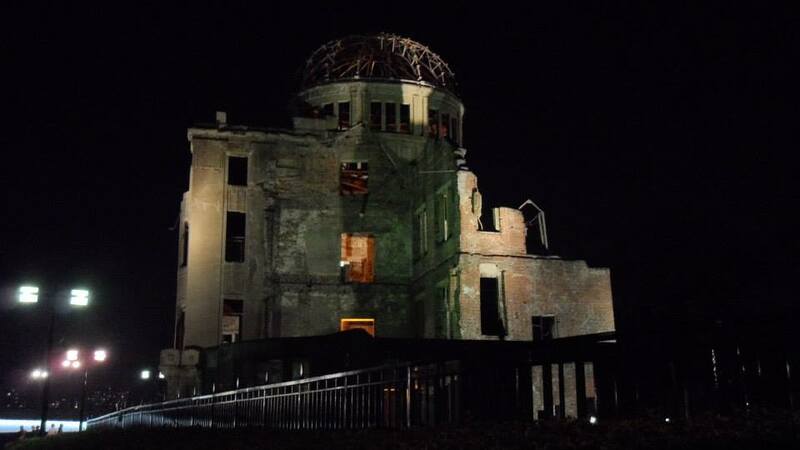 It was only about a 15 minute walk from the Atomic Bomb dome. The first thing that you notice is the beautiful park that surrounds it! Then we approached Hiroshima Castle itself! The most main aspect that stood out to me was the wood structure! I had been to Osaka Castle, Nagoya castle, and Nijo Castle in Kyoto, but this was the first castle I had seen that was made out of wood. The second thing that stood out to me was how small it was compared to the other castles I had visited before. To get inside the castle it costs 400 yen, I believe, but if you are a student or exchange student at a Japanese university you can get in for free! Inside the castle was a museum, as many of the castles in Japan have, where you can’t take many pictures. 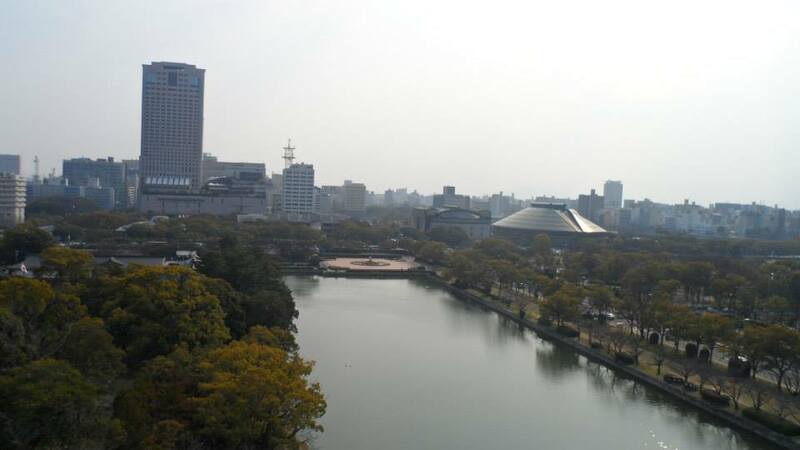 There is an observatory at the top and you can get a really pretty view of Hiroshima! Part of Hiroshima from the top of Hiroshima Castle. Picture by me. After Hiroshima Castle, Meghan and I headed to a shopping center we saw on the way to Hiroshima Castle. We had Lunch there and then proceeded to go to the Shopping area. I will make a post on the shopping places in another part of my Hiroshima posts! After Shopping and eating dinner, later that night we passed by the Atomic Bomb Dome again on our way back to the Hotel and it was an amazing, but an even more eerie sight than earlier that day because there were no people there and it was lit up from the inside. Hiroshima Peace Memorial, Atomic Bomb Dome, at Night. I hope you all enjoyed this first part of my Hiroshima trip! I think I will have 2 more parts of this trip, including shopping and a museum, and Miyajima Island. Please keep a lookout for those coming up!